... which game you want to win. ... which prize you want to collect. ... which priorities you want to set. It's a thrill to win at checkers or Clue or Trivial Pursuit. You sweep aside the other players and you ?own? the board. It's also a thrill to win a promotion at work ? the new house you wanted ? that sports car you've always eyed. But just like the game cards, the tokens, and the timer, those prizes are temporary. When the game is over, they all go back in the box. Games can cast a powerful spell, says bestselling author John Ortberg. But the wisest player remembers that the game is always going to end. So what can we take with us to the kingdom of God? Only the love we have for Christ, the love we have for each other, and our own souls. While it's not bad to be good at chess or Risk?or the game of life on Earth?we can?t allow it to get in the way of what really matters. 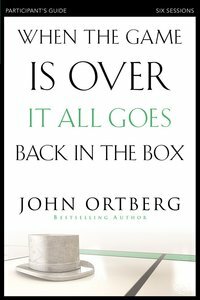 Using his humor and his genius for storytelling, Ortberg helps you focus on the real rules of the game and how to set your priorities. When the Game Is Over, It All Goes Back in the Box Participant's Guide helps explain how, left to our own devices, we tend to seek out worldly things, mistakenly thinking they will bring us fulfillment. But everything on Earth belongs to God. Everything we ?own? is just on loan. And what pleases God is often 180 degrees from what we may think is important. You can?t beat the house, notes Ortberg. We're playing our game of life on a giant board called a calendar. Time will always run out, so it's a good thing to live a life that delights your Creator. When everything goes back in the box, you'll have made what is temporary a servant to what is eternal, and you'll leave this life knowing you've achieved the only victory that matters. About "When the Game is Over, It All Goes Back in the Box (Participant's Guide)"